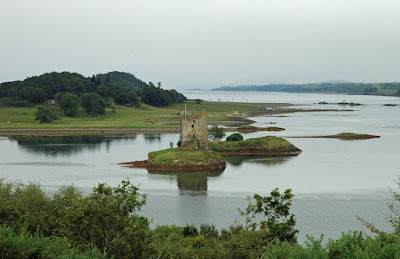 Castle Stalker, or Stalcaire in Gaelic, lays at the Southern entrance to the Sound of Shuna, and in the Western end of Loch Laich. It is built on a rocky outcrop called the Rock of the Cormorants. The site is thought to have been occupied by a smaller defensive building from the 1320’s, when the MacDougalls were Lords of Lorn. The MacDougalls lost the title of Lords of Lorn when they were defeated by King Bruce at Brander Pass in 1308. The title was regained briefly by the family, but lost again in 1388, with the title passing to the Stewarts. 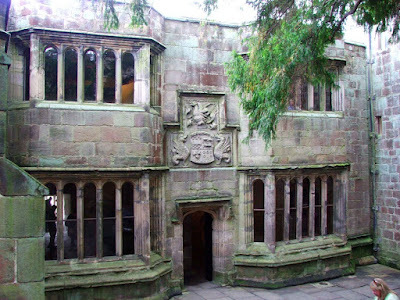 It’s thought that the building we see today, was built by Sir John Stewart in around 1446. The castle was reputedly a frequent haunt of King James IV of Scotland, who used the castle as a base for hunting trips to the Highlands. 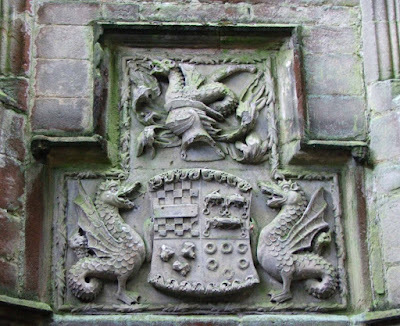 The addition of the top floor and the roof were probably due to the Royal visits, and a coat of arms that survives over the front door of the tower is probably the Royal arms. The castle really is a simple structure, consisting of a four storey keep, accessible through a doorway on the first floor at the top of a flight of stone steps. Its main defensible qualities come courtesy of the fact that it is difficult to reach, accessible only usually by boat, and on foot at low tide. An interesting note: the castle may be familiar to Monty Python fans, as Castle Aaaaaaaargh, the likely resting place of the Holy Grail. King Arthur and Sir Bedevere attempt to storm the castle but are beaten back by the French who have occupied the castle and drive them away by throwing farm animals at them. Gylan Castle has seen better days. The ruins are now roofless, and a certain amount of consolidation work has recently been undertaken to ensure the castle’s survival. The ruins lay on the South West of the Island of Kerrera, at the foot of Cnoc Biorach, guarding the bays of Port a’ Chaisteil and Port a’ Chroinn. 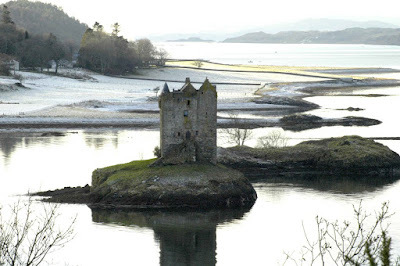 The tower was probably completed sometime around 1582, and was a base for the MacDougall clan. The tower was probably situated on the South West of Kerrera to provide cover for the Southern approaches to Oban through the Sound of Kerrera. Above. Gylen castle from the South West. The surviving remains consist of the main block of the tower, which is built in an L shape, and stands to four storeys. The stair tower can still be seen jutting out of the West angle of the tower. The walls of the tower still have a variety of small windows, shot holes and gun loops. The entrance defences still survive, and consist of two 1 metre thick, parallel walls that contain loop holes and still stand to around 2 metres in height. These walls lead into a vaulted passageway and then into a small courtyard which in turn is protected by the cliff faces below it. In 1647, General Leslie laid siege to the castle, and when he gained entry, had the tower burned. It’s likely that it was never inhabited after this. The extent of the damage caused by General Leslie’s sacking of the tower were evident when it was excavated in 1988. There were soot and ash marks up all the internal walls, layers of burnt timbers and straw on the floor of the tower and the slate roof, now lying on the floor, was reddened from the heat of the blaze. 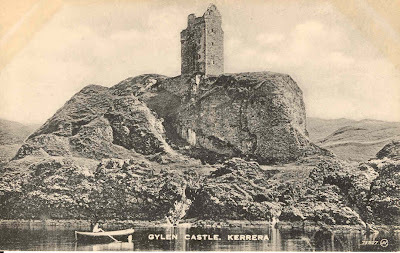 Following the recent consolidation, the tower has been rescued from its slow demise, and visitors setting foot on Kerrera can now even enter the tower to view it. Photo courtesy of John Jefferies. On a small rocky outcrop, Kisimul Castle, a stronghold Of the Clan MacNeils since the 11th century, guards the bay. The castle consists of a strong square keep at one end of the small island, with a high curtain wall around the courtyard. The castle was built with comfortable defence in mind, with its two artesian wells and a fish trap in a basement. The castle was equipped to fend of any attack using a small ship that was permanently berthed alongside the castle walls. At the first sign of trouble, the ship was to be launched by its crew and sent to see off the attackers. The castle’s walls range from 4 to 7 feet in thickness, and are about 50 feet high. There is evidence to suggest that the walls were raised to their current height some time in the past. The keep, situated at the South East of the island, is four storeys high, with walls of 6 feet in thickness. In 1838, the 21st chieftain of the Clan MacNiel was forced to sell Barra, including the castle, and it wasn’t long before the structure was in ruins, with some stone from the castle allegedly turning up in Glasgow as paving stones. In the late 1930’s, Robert Lister MacNeil, the clan chief at the time, purchased the castle. By the time he died in 1970, the castle had been restored to its previous condition. Robert’s son, Ian Roderick took over ownership of the castle, and in March of 2000, it passed into the care of Historic Scotland for a 1000 year lease, with a ground rent of £1 and a bottle of whisky per annum. Photos courtesy of John Jefferies. 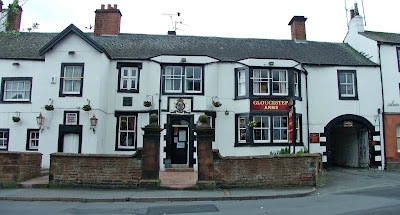 At the junctions of Rowcliffe Lane and Angel Lane, the Two Lions inn now sits empty and boarded up. Probably built in the latter part of the 16th century, the property possibly represents the remains of a fortified house. Above. Looking into the courtyard. Looking from the road into the courtyard, the Two Lions consists of a roughcast two storey building, with a doorway leading to the rear of the property. There are the remains of stone mullioned windows in the rear wall facing the car park, and a studded door can still be seen at the head of the alley. Stables stand to the left of the courtyard, probably dating from the 1700's. The porch is modern, as is the larger of the three windows fronting the property. The two smaller windows may be original, although all detail seems to have been lost over time. The main door of the inn apparently shows signs that it had a draw bar, fortifying the entrance. 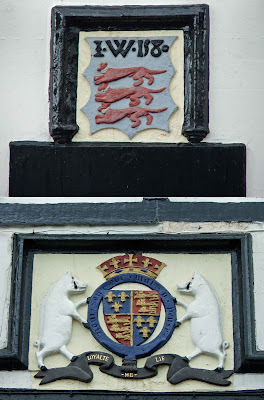 Although the interior was not seen, records state that there is a fine plaster ceiling showing the Lowther family arms. Indeed, by all accounts, the building seems to have been the family home of one Gerard Lowther. Lowther was Sheriff of Cumberland in 1592, and also later the Lord Warden of the West Marches......and probably erected the building in 1585. Above. 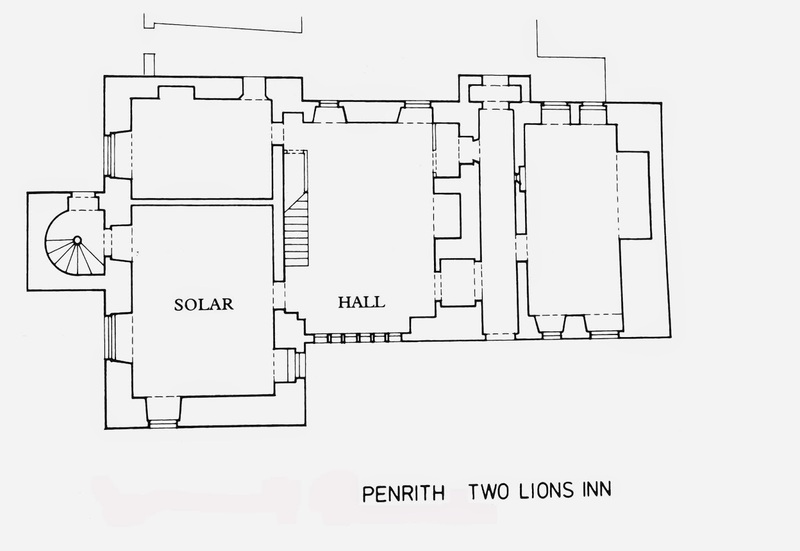 Floor plan of the Two Lions Inn. 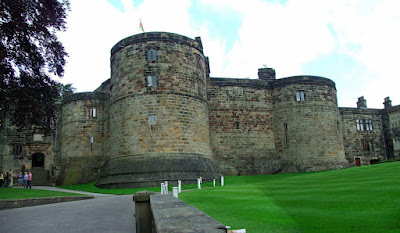 Gerrard was involved with his brother, Sir Richard Lowther, in attempting to release Mary Queen of Scots from her captivity in England, probably from Carlisle Castle, and probably around 1568 to 1570. Gerard Lowther was one of the forebears of the Lowther family, who were the Earls of Lonsdale. Above. 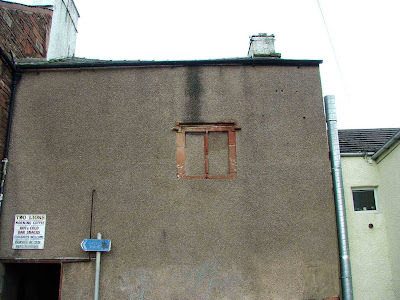 One of the old windows at the rear of the building. Across the road the Duke of Gloucester Inn still stands, a much changed pele tower reputedly once the quarters of the Duke of Gloucester, who later became King Richard III. In recent months, the building has been renovated and returned to use as an inn. I'll need to photograph the building as it appears now and add them to this post. 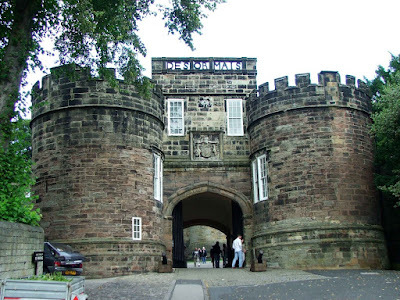 Skipton Castle sits to the North of the A6131 as it runs through the North Yorkshire market town of Skipton. An imposing medieval structure, the castle sits above Eller Beck to its North, with a deep ravine providing protection here. To the South, West and East, remains of a moat have been found, although these have since been built over. It’s thought that the castle first began to take shape in around 1090 under Robert de Romille, a Baron of William the Conqueror. The original building would most likely have been a simple earth and timber motte and bailey castle. The castle was however, soon rebuilt in stone by William le Fortibus, and it is upon these foundations that the present day castle is founded. Only one 12th century piece of masonry remains, a simple arch, hidden away in the building. 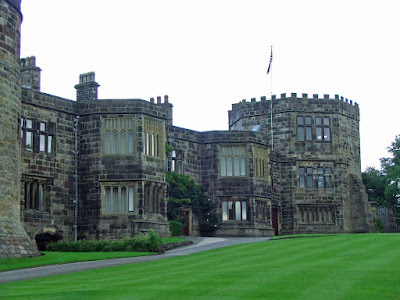 By 1310, the castle had come under the tenure of the Cliffords, a staunchly Royalist family who backed the house of Lancaster during the Wars of the Roses. 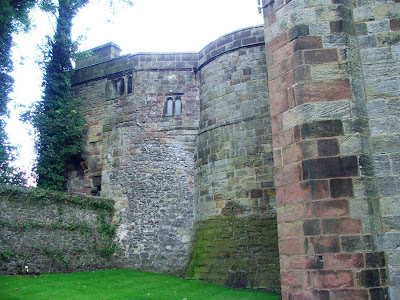 Under the Cliffords, the castle underwent many changes; with the addition of massive stone drum towers in the bailey area, and the building of a curtain wall to encase further buildings within the castle’s protective walls. Robert Clifford was responsible for much of the building work done during this period, but he was killed at the Battle of Bannockburn in 1314. Roger Clifford, his son, too over the castle, and continued with the re-enforcement of the defences. Robert’s and Roger’s defensive improvements can still be seen today. After walking through the gateway, which was a later addition, the first of the two huge drum towers can be seen straight ahead. To the left of this tower one half of the original 12th century gatehouse can be seen, half of the tower protruding from the wall. Its opposing tower is hidden behind the later 17th century entrance built by Lady Anne Clifford. The two towers are shown here. The rest of the drum towers, including the right hand one in the first photo, are all dated to the 13th century. Inside the castle, the main drum tower, the first one to be seen, shows the scars of Cromwell’s ‘slighting’. The tower was demolished down to the first floor, and upon Lady Anne Clifford’s rebuilding between 1657 and 1658, the walls are half as thick so as to adhere to Cromwell’s instructions not to make the castle a defensible structure. 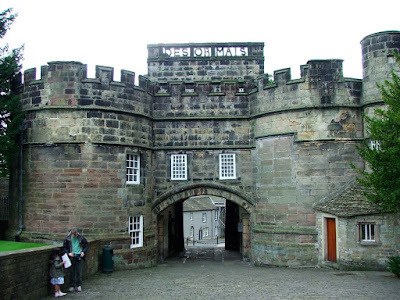 The castle gatehouse was built around 1485, when the castle was returned to the Cliffords after the Wars of the Roses. 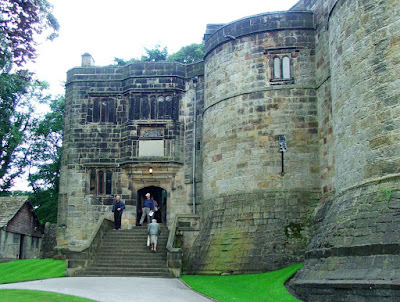 The gatehouse consists of four large round towers, with apartments built in between them. Topping the embattled parapets of the towers the Clifford motto can be seen….”Desormais”, Henceforth. 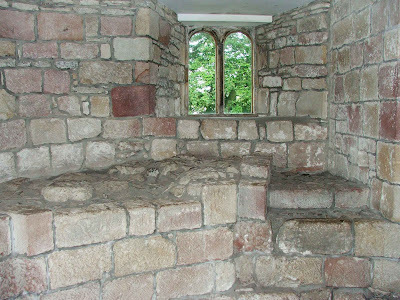 The large windows in the gatehouse demonstrate the fact that this was not built, or rebuilt, as a defensible structure. The wooden doors do however bear the marks of the Civil war siege. 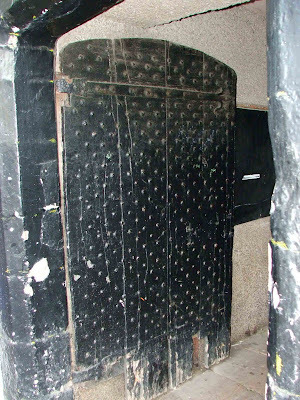 High up on both doors, small now filled wooden holes can be seen, possibly indicating niches that were used to fire muskets at the attackers. The castle is built around a small courtyard, called the Conduit court, and consists of a Hall, kitchens, apartments store rooms, as well as passageways to the drum towers, dungeon and document store rooms. All are in excellent condition thanks to Lady Anne Clifford, who was allowed to restore the castle between 1657 and 1658, after the Civil War. Cromwell’s instructions were that the castle could be rebuilt on the condition that the walls that were rebuilt were not strong enough to resist cannon shot, and that any roofs that were replaced, were not strong enough to support cannons. He was determined that the castle should not be used as a military stronghold again. The siege that his army put the castle under, lasted nearly three years (1643 to 1645), and during this time the castle was nearly completely destroyed, leaving little work for his men when they came to slight the remains. About two miles to the North West of the castle, high up on the hills overlooking the town, a civil war battery can still be seen. This area, just over the brow of the hill, gave Cromwell’s parliamentarian troops the ideal position from which to fire directly into the castle. The castle’s occupants would not have been able to see the battery, as it is built just out of sight, however, the cannons sited here would have been able to fire repeatedly at the castle pretty much unopposed. 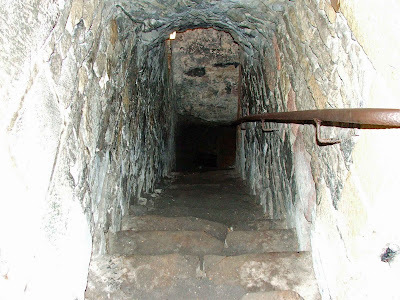 The battery consists of a raised area of land, perhaps 40feet by 40 feet, and about 2feet high at its tallest point. There were another two battery sites in the town, used to bring cannon fire down on the castle. 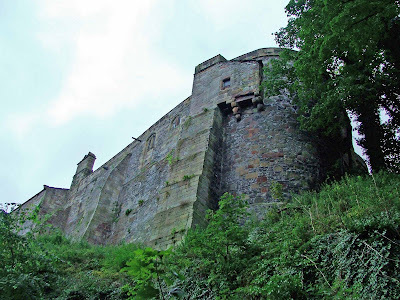 One was sited directly to the South of the castle and now has a housing estate built on it, and the third one has been lost, with no records stating where it was. 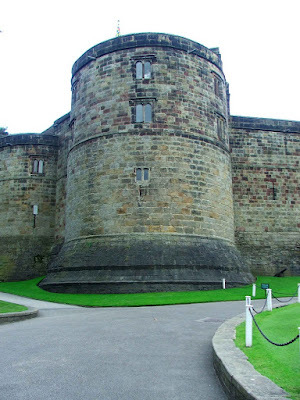 The walk around the castle gives the visitor unblocked views of the castle from all angles. Leaving the castle gatehouse and turning left up the A6131 affords great views of the thin curtain wall, rebuilt by Lady Anne Clifford, and the one remaining bastion tower. 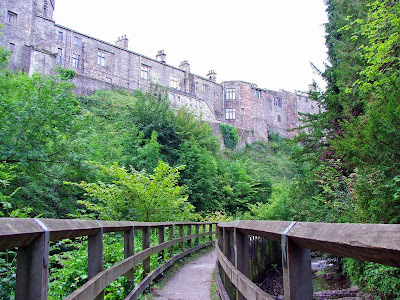 However, the best views can be had, when taking the river side walk to the North of the castle. Eller Beck, as mentioned above, provided a natural barrier against attack, and it is this walk that gives some awesome views of the rear end of the castle. High up above, Elizabethan and 13th century buildings can be clearly seen, demonstrating the difficulty any attacker would have faced.